A New York City Police Department car is viewed in Times Square in 2013. It was a hoax. That’s what police say about a Brooklyn, N.Y., woman who claimed she had been raped Saturday by a black man, the New York Daily News reports. She recanted her story just hours after stumbling, tattered and scratched, into an emergency room at 2:15 a.m. Saturday, the report says. Police tell the News that no criminal charges are expected to be filed against the 20-year-old woman, who described the man as 6 feet 5 and 220 pounds. 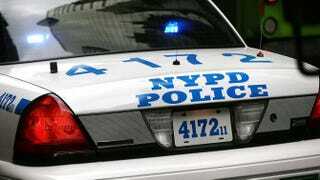 She said the attack occurred about 12:15 a.m. in a park in Brooklyn’s Williamsburg section, the report says. She alleged that the suspect, who cut her blouse and bra before forcing himself on her, was wearing a black beanie and a mask, the News writes. Officers spent hours canvassing the neighborhood for evidence and surveillance video but came up emptyhanded. That’s when the woman admitted she lied about the whole thing, police tell the News. It was not known why she made up the story.